Late last September I lost my going nowhere job. I'd been dreading the inevitability of it, but when it finally happened, rather than defeat, I felt tremendous relief. Almost immediately, I realized that this was it. The time had come to do whatever it takes to make my way through more creative exertions. I can't keep just getting by - it takes too much energy and consumes life. So I began looking for ways to produce on my own. I wrote some. I searched for calls to artists. I reviewed my photographic archives and considered the possibilities of selling them in the saturated market of newly inspired digi-photographers. One of the opportunities I found is the Sculptcycle exhibition through the city of Montpelier and Montpelier Downtown Community Association (MDCA). 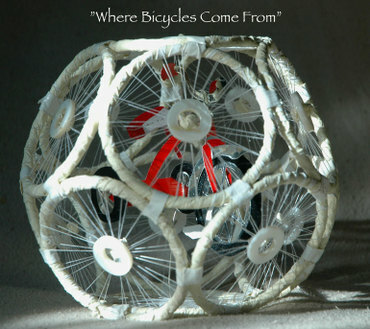 At first, I was disappointed, because it is a call to create sculpture from recycled bike parts, and I immediately though I couldn't do it because I don't have heavy equipment, a shop or for that matter know anything about welding. "Why do you need to weld?" B asked. "Good point." I thought and my mind opened to the possibilities. That night, I thought about it even in my dreams. The next morning I woke up on fire with the idea. Before I'd even gotten out of bed I tried to draw it out. I can draw, but this design exceeded my technical abilities so I began thinking about other ways to present it. A model! Thrilled with it so far, I couldn't let it go at just that. I wanted a truer representation of the final object in lieu of that technical drawing I wasn't going to be able to produce to my satisfaction. Off to the craft store I went and came back with brass rings, white duct tape, and a small die cut of a tricycle meant for scrap booking. I put the thing together immediately and by that evening, I had the more elaborate model, the proposal, a brand new artist's resume and the rest of the application packet intact and ready to mail. 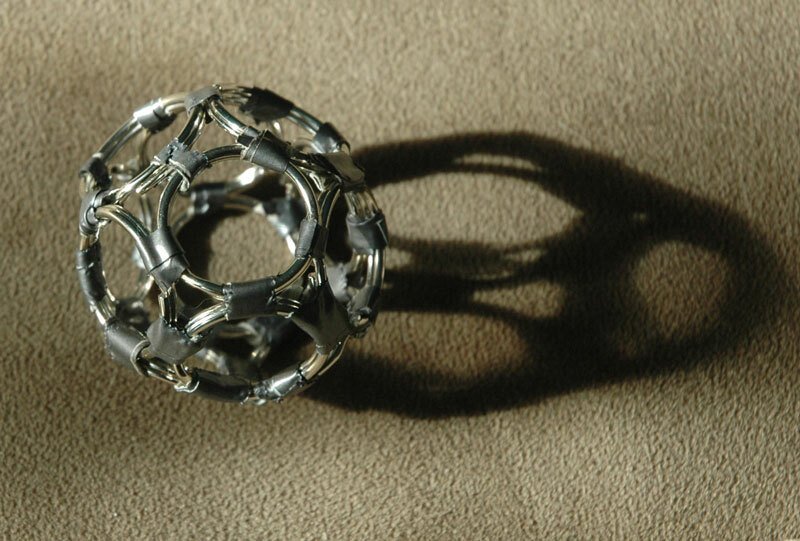 The actual piece will be approximately 5x5', made from 12 bicycle tires, spray painted white and wrapped in white duct tape lashed into a dodecahedron. A tricycle will be suspended in the center with fishing line. The spore like structure will hang from fishing line from an as yet to be determined tall object in the downtown Montpelier area, so as to appear to float in midair. That's a great piece. It looks as if you can fashion art out of anything. That piece should be at the MoMA. By the by, you can write a little, too. Thanks Dave. I appreciate your continuing support. Congrats on getting accepted...as a midwife and a biker I am thoroughly enjoying your submission! I love it! I can't wait to see the finished sculpture. Good luck! 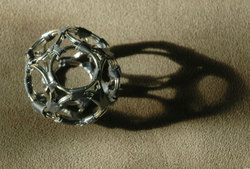 I saw this when you first posted it, and I thought that I have wheels that could be used to construct this sculpture. I know you live far from Minnesota so I didn't volunteer to help. I assume you have found the parts by now. I was thinking of my own sculpture (not for the show) made from a bike frame that would serve as a picture frame for the following image. Good luck with your sculpture and the show.